This is the Pyrit hair and look what it did to her face! ARRRRRGH. 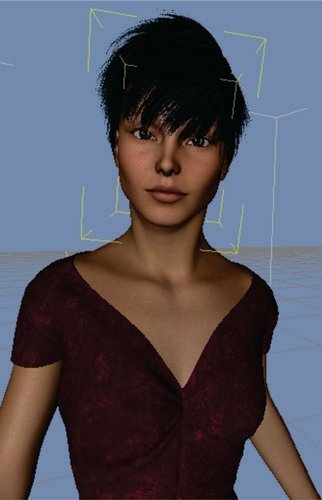 Apply a smoothing modifier to the hair and then, in the Parameters tab, set Collision Iteration ON, and set the hair's collision to collide with the figure (I presume it's Genesis). I also typically set Smoothing to 1 instead of the default 20. Thanks for the help- can we start with this- I have no clue what a smoothing modifier is- where is that? EDIT- I cant find the other stuff either, I am aimlessly opening everything in Parameters. A clue perhaps? (I have to get to bed, it's 5:15am and I've been up all night, so that isn't helping. Sorry!) Can you guide me step by step here? Appreciate it! For smoothing modifier, do you mean in Surfaces (Color) where it says Smoothing? (With Pyrit Hair selected) It already says ON. I went to each section though and made sure. All were already ON. Note this still doesnt highlight that splotch to the far right. 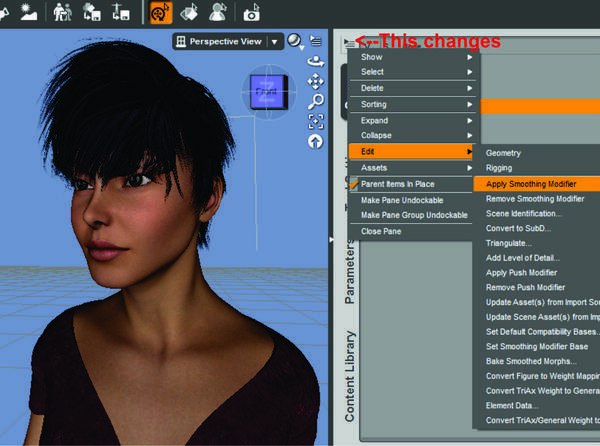 In your scene tab, (it should be on the right hand side of the screen, along with Parameer, Content Library, and Tool Settings) select the hair, then click on the "Disply Active Scene Tab options, icon in the top left corner, drop down to Edit>Apply Smoothing Modifier. 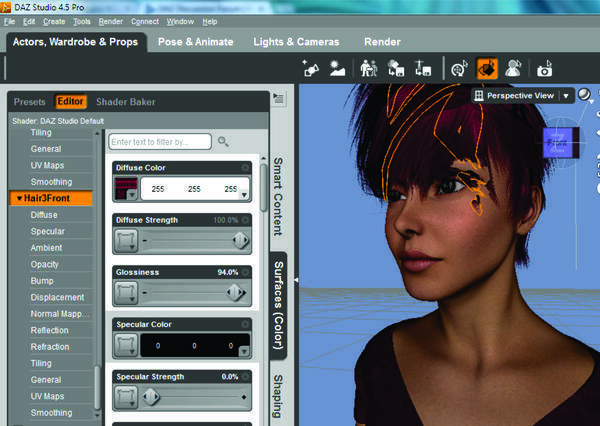 This will apply the Smoothing modifier to the hair. 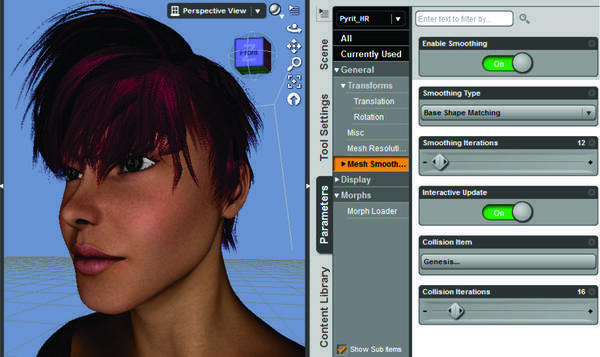 Then click on your Parameters tab, click on the General drop down menu and select Mesh Smoothing. This will open up your Smoothing options. Then follow my previous instructions. That's because the "Edit>Apply Smoothing Modifier" option is in the Scene tab's display options, not the Parameter tab's. It's moot anyway since you already had a Smoothing modifier applied, it was just not enabled. but auto-follow morhp which generated to the hair, cahnge hair shape much too. I think it is because auto-follow eye lush morph effect. 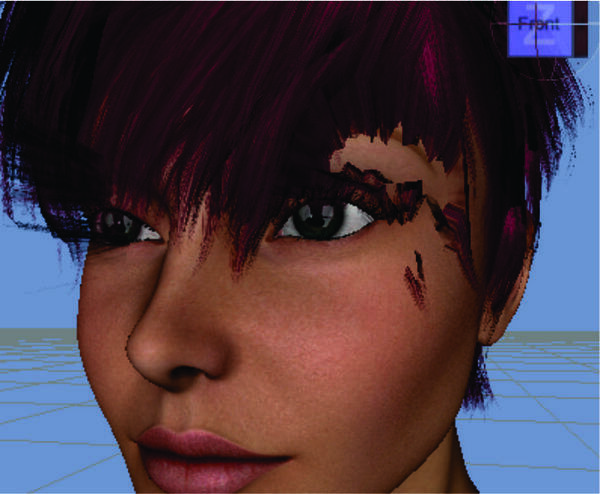 if your character use eye lush layer morph, it move back part of eye lush into head and invisible. 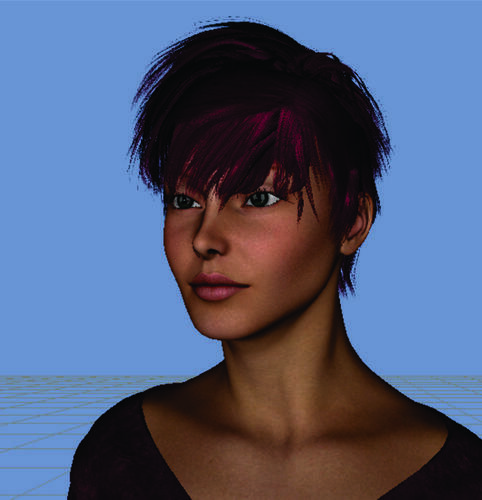 so you may check auto generated morph about hair. Not necessarily. It depends upon how "Smooth" you want it, or how detailed. I prefer more detail, and only raise the smoothing higher when absolutely necessary. Thanks, I'll read the thread after I get some sleep. I'll have to continue this later, it's now 6am and I have to stop before I keel over. Appreciate everyone's help- and that thread looks interesting. One more thing- what is the collision iteration? What should that be set on? Collision Iteration is what determines the level of collision and how far from the object being collided with, the mesh collides. The smaller the number, the less collision. And is collision equivalent to the amount of area that the two surfaces touch? So a low amount of collision would be less contact? Not quite. The lower the collision iteration, the more the meshes will pass through one another, and, thus, the more "poke-through". I got it down to 12 in the smoothing iterations, when I went lower, some of the strands were acting weird. Could probably take it down to 10 or so. Not seeing much difference when I did. So is 16 a high or a low number for the collision iterations? I havent a clue what I'm doing. Tramp Graphics- appreciate you very much, just wanted to repeat that. This hasn't been the most fun for a first render, but having you help has made all the difference in throwing in the towel or trying to get it solved. And I'm thinking this will help a lot of other newbies. It's moderate. The base line minimum is typically 3. On occasion, I've gone as high as 100 collision iterations. How can you tell what the collision iterations are doing when you change the slider? I'm not seeing anything. Also, is there supposed to be a huge lag between the times you move the slider, is that normal? )Or could it be my computer, or Studio getting ready to crash on me again? I typically don't use the slider. I type in the number I want. I could,t tell you about the lag time. Could be using too much RAM. Thanks so much. Signing off for now, trying to figure out hair morphs but am exhausted. I found them but not sure what all the abbreviations are, and I have a LOT of lag. 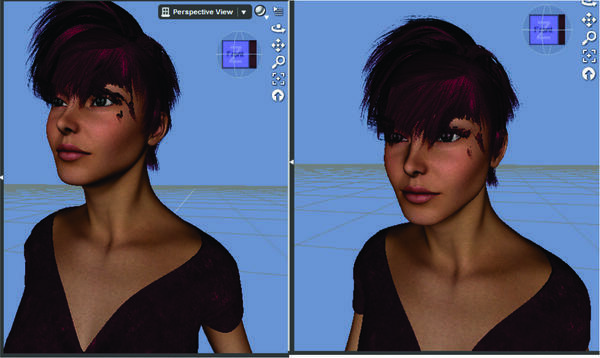 I did move her bangs over to the left (as you look at it) and shortened them. This is a fun hairstyle! 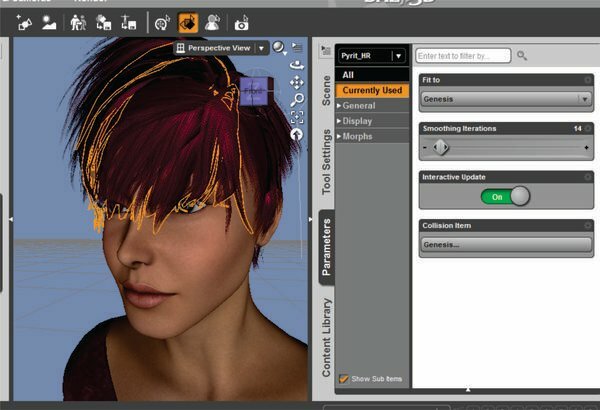 (Pyrit hair, for anyone who is interested.) Lots of color choices and morphs. Hi Novica, I like the look of your character! The lag you are experiencing is probably due to the smoothing modifier...it means the computer has to make lots of calculations every time you change something. Some people like to turn smoothing off until the scene is ready to render...obviously that's probably not the best option in this particular example since smoothing seems to be essential to what you're trying to get the hair to do. But do take a look at that link that kitakoredaz posted...itmight be a way to solve your problem without using the smoothing modifier so much. 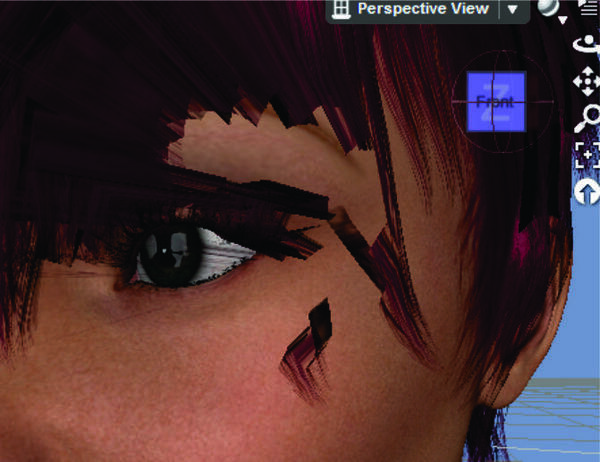 In case you haven't seen it, I thought I'd provide a link to my tutorial on hair: http://www.daz3d.com/forums/discussion/5646/ There's a surprising amount of stuff to learn when it comes to hair...the tutorial doesn't cover everything, but I hope you find it useful. I certainly learned a lot just in the process of putting it together. Thank you :) I made changes, turned her in all directions, more slider work, turned her, more slider, turned her...for several hours- and that was just the face. It was because it was so much FUN! I didnt want a drop dead gorgeous model, I tried for a pretty gal. She looks good from all angles. Haven't started really messing with the hair morphs yet. Just got a couple strands out of the eyes. I just got up at 2pm (six hours of sleep) so I can pour over this thread. I do have one thing that I found- this was on the right side of the page, not left- that's why I couldn't find it when it was mentioned. (Not complaining, really appreciate the help.) Thought I would show that so other newbies would know. Another thing (can you tell training was my profession?) to remember, that little box up there changes, depending on what is selected. If you have Scene, it gives you different options than if Parameters is selected. I know, common sense would tell you that, but not necessarily for noobs. Will check out the videos and tutorials now. A few adjustments but not many. The shirt can be had for $1.99 and is Casual 1950 For Genesis Female. Here's a closeup of my figure wearing it. 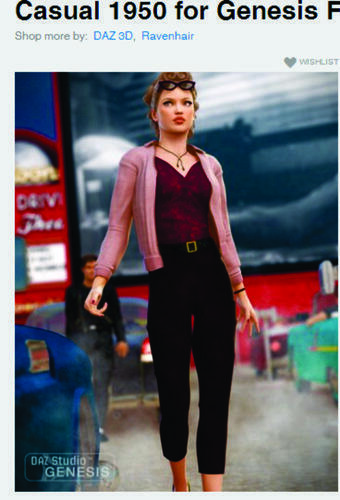 You can also compare her more easily to Caitlyn, in a front view. Added Caitlyn to my wishlist :) holding back on shopping till march madness, still need to install all my products with DIM.